We’re really excited to announce that Microsoft has presented Web Profits its APAC Rising Star Award at its inaugural Global Bing Partner Awards ceremony held in Seattle, USA. 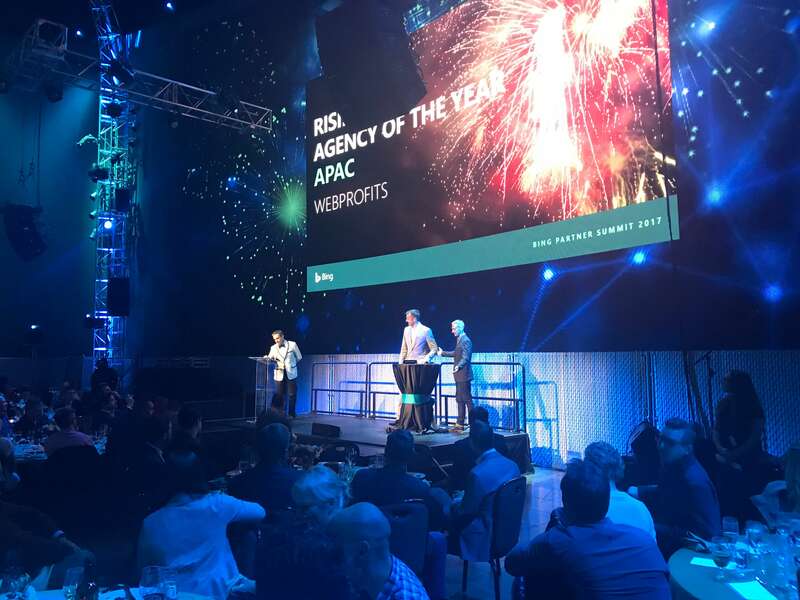 The awards honour individuals and organisations behind some of the most impactful, innovative and performance-driven work from Bing Ads’ Partners in North America, Europe and Asia Pacific. The recognition follows the biggest year in our history, in which we opened two international offices. In the second half of 2016 we started operations in the highly competitive US market in partnership with leading American digital marketer Sujan Patel. That was followed by opening our doors in Singapore on the request of long-term client Bellamy’s Organic. The past 12 months has seen Web Profits accelerate growth locally and now internationally, at a time when digital marketing is becoming more complex and the demands from clients for greater returns on investment have never been higher. We continue to evolve our offering, through products such as our full-service Fluid Online Marketing, and this global recognition from Microsoft demonstrates that our talented team are delivering innovative and effective solutions for our clients. For a full list of winners please visit here.